Auto-Mailer PRO is fully integrated with the website. This means that as you update the website the mailer can automatically create and send newsletters informing your members (or anyone you want) of all the latest news, offers and upcoming events. Undoubtedly the best marketing decision we made last year was to replace our outdated website with a new and unique website created by Premium Golf Websites. Our new website is modern, interactive and easy to navigate and we are confident that it has been instrumental in helping us achieve a 50% increase in bookings for the coming season. With any specialist software it is essential that the provider has a comprehensive knowledge of the product and provides professional and swift support in the event of any problems, or even if you want amendments to the website. I am pleased to say that Premium Golf Websites have excelled in this capacity. I have also been impressed with their technical knowledge and have yet to find a problem or request that is not dealt with efficiently and effectively. I have no hesitation in recommending Premium Golf Websites if you want an effective solution to your online presence. The new website is simply stunning. We have even received praise from Golf Development Wales, Golf Wales Magazine, from national companies that say we have the best golf club website they have seen. We are really pleased! 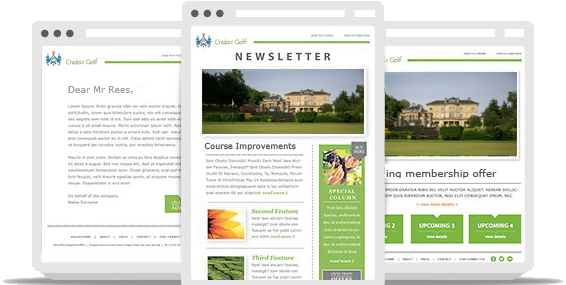 Cradoc GC engaged the services of Premium Golf Websites in January 2016. The Club's existing website was dull, not user friendly for updating in house and was out of touch with social media and other modern day customer driven requirements. Andy's involvement from the start of the whole of the re-development process was passionate, intense and forward thinking. His experience as a golfer and producing other such like websites was clear to see and extremely helpful. Cradoc GC launched the new website on April 22nd and got 1200 page views in the first 48 hours. We continue to receive 120+ visitors to the website on average each day and similarly 350+ page views on average each day. As we approach 2017 we are also now seeing regular enquiries for both golf and clubhouse facilities, nearly all turning into revenue producing leads. We are confident this will increase as we look to develop further. Perhaps more importantly however, the staff that update the website on a daily basis are extremely happy with the back office operation, as it is very user friendly and efficient. In summary, Cradoc GC has seen tangible benefit from engaging Premium Golf Websites to produce a new website, the members and staff all like the new site very much and we would have no hesitation in recommending Andy's services to other Clubs. Browse 'Demo' and 'Premium Demo' to decide which version suits you best. Also choose which optional 'Support Package' is best for you. We run a technical check so we can tell you what information we need about your current set-up for a successfull switch to the new website. Once we receive the completed form and file back, your new website will be ready within 10 working days with all information uploaded and ready to go. Priority support is provided completely free of charge for 5 working days after launch of new site to ensure everything is running smoothly and to help you with any last minute additions and adjustments. Depending on which optional support package you choose you can always contact us for assistance and support.